Hi! If you read my newsletter you know that I have been very busy this year getting ready for my first big effort at craft shows this year. I have designed a booth - drawing on my skills from my U of A Residential Interiors Course - I knew that would come in handy some day! My talented husband is building it for me. And I have been sewing up many different types of stock for my booth. I have been reading blog posts, books and ebooks and I came across this really good one that I am sharing with you today. Note: This post contains affiliate links. If you click on those links and buy I may receive a small commission at no additional cost to you. For more on affiliate links please see my "About" page. 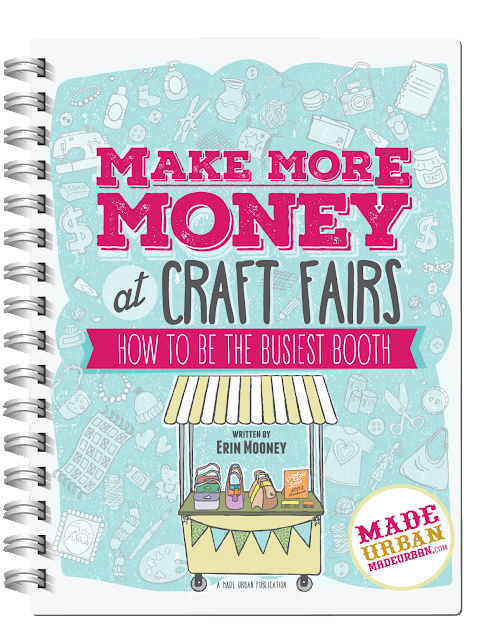 I bought my own copy of Make More Money at Craft Fairs - How to Be the Busiest Booth and I am amazed at the quality and quantity of information in here! This is definitely going to save me a lot of trial and error and it will do the same for you if you choose to buy it. If you're already knowledgeable with Craft Fair and just need some new ideas to step up your game you can purchase this version of the book. And if you're a Craft Fair pro and you want to stay on top your game there is this version as well. However, for the most bang for your buck I recommend the Ultimate Guide which is the one I purchased. Erin Mooney, who is the author and also the blogger behind the Made Urban Blog, draws on her own experience as a craft fair vendor as well as her experience working in big retail stores to help us gain the upper hand with our craft fair booths and table displays. She also has advice to keep us from trying to do too much and getting overwhelmed along with many other useful topics. This 291 page interactive ebook contains worksheets and checklists to help us keep on track, absorb the information and apply it to our own situations. There are 11 chapters and a section of checklists and printables. This ebook is actually an ebook. There have been a few times in the recent past where I have bought an ebook only to find it is only 20 pages long (or less!) and felt disappointed. Not so with Make More Money at Craft Fairs. I feel I got my money's worth and more with this purchase and I will be referring to it over and over again. I hope I have helped to introduce you to a useful resource today! Thank you for stopping by my blog.